Posted on Mon, Jan 23, 2012 : 10:31 a.m.
Trey Burke is closing in on Indiana's Cody Zeller for the Big Ten Freshman of the Year honor. The Michigan basketball point guard was awarded the conference Freshman of the Week distinction Monday for the fourth time. Burke's four weekly honors are only one behind Zeller. 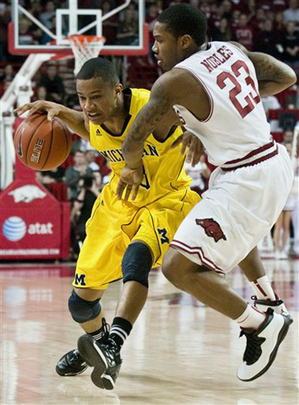 Michigan guard Trey Burke is the Big Ten Conference Freshman of the Week for the fourth time this season. Burke averaged 16.5 points, 5.5 rebounds and 4.5 assists per game last week for the Wolverines, who knocked off Michigan State before falling at Arkansas. Against the rival Spartans, Burke dropped in a game-high 20 points and handed out the game-winning assist as Michigan earned its first three-game winning streak in the rivalry since 1998. Burke had 13 points, seven rebounds and six assists against Arkansas, and just missed a potential game-winning 3-pointer at the buzzer. Zeller, who entered the season as the consensus favorite for BIg Ten Freshman of the Year, leads conference rookies with 15.1 points per game. He averages 6.4 rebounds and 1.5 assists per night. Burke is just behind Zeller with 14.6 points per game. He leads Big Ten freshmen in assists (4.9 per game), minutes (34.7) and 3-pointers made (32). Combined, Burke or Zeller have been honored as the league's Freshman of the Week all but twice this season. Michigan (15-5, 5-2 Big Ten) returns to action Tuesday at Purdue (7 p.m., ESPN).